More than one million NHS staff, including nurses, porters and paramedics, are being offered increases of at least 6.5% over three years - with some getting as much as 29%. The deal has been formally agreed by union leaders and ministers on Wednesday and will cost £4.2bn. Staff will now be asked to vote on the deal, with rises backdated to April if they agree by the summer. The deal is tiered with the lowest-paid in each job receiving the biggest rise. The agreement covers all staff on the Agenda for Change contract - about 1.3m across the UK - which is the entire workforce with the exception of doctors, dentists and senior leaders. Sara Gorton, lead negotiator for the health unions, said: "It won't solve every problem in the NHS but it will go a long way towards making dedicated health staff feel more valued, lift flagging morale and help turn the tide on staffing problems." Danny Mortimer, chief executive of NHS Employers, said "compromises" have had to be made but he predicts the deal will make the NHS a "desirable" employer once again. NHS at 70: what are your NHS memories? The unions, which represent staff from all over the UK, have been in talks with English negotiators. The deal will now be put to staff in England with the results of that consultation expected by July. If they agree it will be backdated to April. Twelve health unions have backed the deal, but the GMB has not. GMB national officer Kevin Brandstatter said the deal promised "jam tomorrow" and did not do enough to make up for the squeeze on pay since 2010. "Long-serving, dedicated health service workers have had thousands of pounds swiped from their pay packets since 2010 by the government's cruel and unnecessary pay cap." It will be up to the devolved governments to decide whether to implement the deal outside England. Scotland has already given its lowest-paid staff bigger rises, so there could be some divergence in how the terms are introduced elsewhere. Want to join the debate? Here's our NHS group - let us know what you think. How good is the deal for staff? When the unions entered talks, they were asking for 3.9% a year. Under the deal agreed on Wednesday, pay will increase by 3% in the first year, but the future years will see smaller rises. Once you take into account inflation - forecast to be 2.4% in 2018, then 1.8% and 1.9% in the following two years - it is likely the rises will be fairly small in real terms. But what is important - for the unions at least - is that many will get much more. How much depends on where individual staff are on their pay bands. NHS pay is split into nine bands, each with quite broad ranges. Those at the very bottom of their pay bands could get up to 29%. Those close to the top are likely to get in the region of 9%. Tracey Budding works as a senior nurse in a neonatal intensive care unit and is an active member of the Royal College of Nursing. She is at the top of her pay band so will only get the 6.5% minimum. But she is backing the offer. "It is a good deal," she says. "It recognises the fact we have not been getting the pay rises we should have. "It makes it easier for nurses to move up the pay bands and that in turn should help attract and retain nurses." The government first announced it would lift the public-sector 1% pay cap in September for police and prison officers, and then followed that with a promise in the Budget that NHS pay would be looked at, lifting the 1% cap a year early. The NHS has been under pressure to retain staff, after it was revealed that one in 10 nurses was leaving the public sector in England every year. 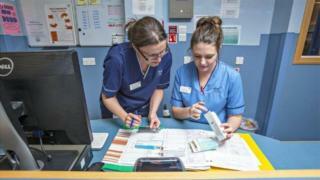 The Royal College of Nursing claims average pay for nurses has fallen by more than 14% in real terms since 2010. Statistics obtained by the BBC from NHS Digital showed 33,000 nurses walked away in 2017, piling pressure on understaffed hospitals and community services. Health Secretary Jeremy Hunt said the cost of the rise would be covered by the Treasury rather than coming out of the NHS budget. "The agreement reflects public appreciation for just how much they have done and continue to do," he added.